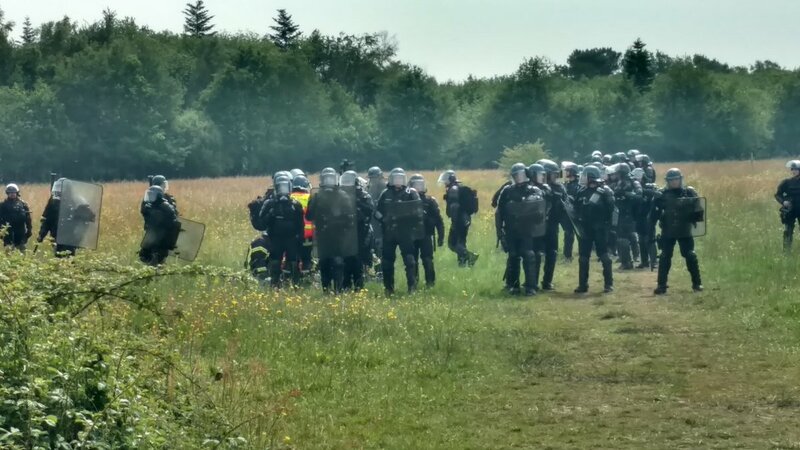 Communiqué of the medical team and caregivers of la ZAD from May 22, 2018. Originally published by Zone A Défendre. Edited machine translation by Enough is Enough. At around noon this morning, a person was reportedly seriously injured following a charge involving shooting from the gendarmerie. The police presence prevented us from helping this person, so we do not know what happened to him and the exact nature of his injuries. For several weeks now, we have been warning of the dangerousness with which the police weapons are used. We condemn the dramatic situation today but are not surprised. We have already had to handle more than 300 injuries in recent weeks following, among other things, shots of grenades GLI-F4, grenades to disperse people and flah-balls. We reaffirm that what the government is doing to suppress la ZAD is likely to cause a death every day, all to continue to destroy houses and places where people live. We would like to be able to say that all the light will be shed on this case, but the dismissal of all the complaints filed following police violence in the spring of 2016 in Nantes shows that there is no justice to expect for these victims . In this situation today the question is more than ever: how far is the state prepared to go to fight the collective forms of life that do not fit into their framework? It is necessary that the police army finally withdraws from la ZAD and stops its attacks. Live Blog #22Mai Day of the barricades – Against #Parcoursup – For a wild May! – Enough is Enough! #Nantes #Breil: Communiqué by the assembly of those injured by the police – Enough is Enough!